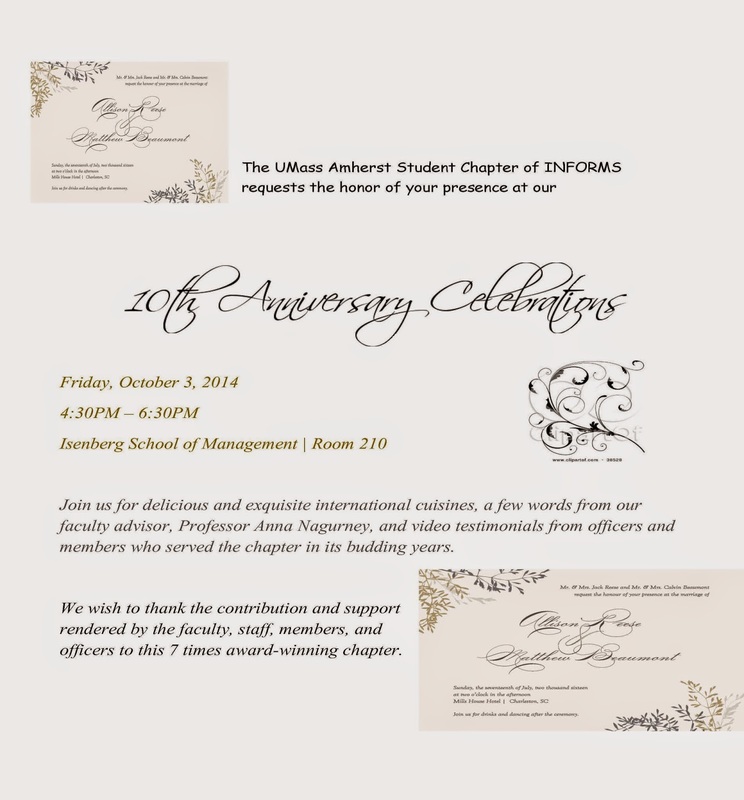 We are very excited that this Friday, October 3, 2014, we will be celebrating the 10th anniversary of the award-winning UMass Amherst INFORMS Student Chapter. The students in Operations Research and the Management Sciences prepared the lovely flyer below. The celebration will take place in the Isenberg School of Management in Room 210 from 4:30-6:30. When I viewed the video below prior to teaching my class this morning I was swept over by nostalgia - the photos in the video over a decade of student activities, numerous guest speakers - you may have fun identifying such luminaries as Dietrich Braess of Braess paradox fame, OR/MS superstars such as Dr. Cynthia Barnhart of MIT, Dr. Ed Kaplan of Yale, and Dr. Les Servi, of MITRE, to name only 3 that we have hosted through the chapter at the Isenberg School. At the celebration on Friday, there will also be several video testimonials from previous Chapter Officers, some of whom are already tenured Associate Professors, and the first Chapter President, Dr. Tina Wakolbinger, who is now a Full Professor. Enjoy strolling down Memory Lane, as much as I did and thanks for such an amazing decade!!! For as long as I can remember, I have been fascinated by networks - their graphical structure and as a means of representing economic activity in terms of product flows, costs, and profits, along with the associated decision-making. Typically, I work on network systems as varied as global supply chains, complex financial networks, electric power generation and distribution networks, as even the Internet, for which we have a large-scale National Science Foundation grant: Network Innovation Through Choice, which is part of the Future Internet Architecture program. In fact, soon I will be getting ready for our almost weekly teleconference among our partners on this project, which we are calling ChoiceNet. Over two years ago, we started working, through a Prime the Pump project, funded by the Advanced Cyber Security Center (ACSC), on cybersecurity and risk assessment. As my readers know, this project was followed by another project, the culmination of which took place only 10 days ago, with a workshop that several Isenberg School colleagues and a College of Engineering colleague at UMass Amherst co-organized with me. 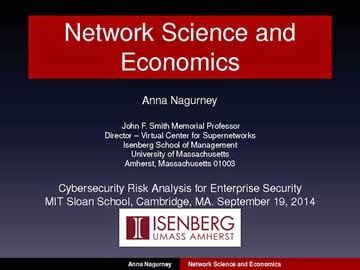 On Friday, September 19, 2014, we hosted a workshop at the Sloan School at MIT, entitled: Cybersecurity Risk Analysis for Enterprise Security, which I blogged about, and which has received some nice press. I very much enjoyed the keynotes at the conference as well as the panels with terrific industry panelists. In my presentation at the workshop on Network Science on Economics, I motivated the major issues through the following graphics which illustrate very dramatically the impacts of cybercrime and, also, if I may say, fascinating research questions. 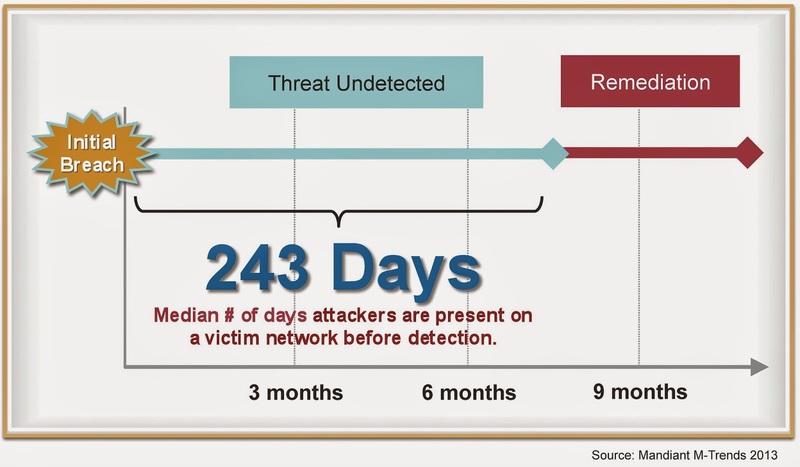 Source: The Economic Impact of Cybercrime and Cyber Espionage, Center for Strategic and International Studies, July 2013, sponsored by McAfee. According to a recent survey cyber crime is placing heavy strains on the global financial sector, with cyber crime now the second most commonly reported economic crime affecting financial services firms. Cyber crime accounted for 38% of all economic crimes in the financial sector, as compared to an average of 16% across all other industries. Every minute, of every hour, of ever day, a major financial institution is under attack (Wilson writing in The Telegraph, October 6, 2013). Cyber attacks are intrusive and economically costly. In addition, they may adversely affect a company’s most valuable asset – its reputation. There is both vertical and horizontal information asymmetry - as noted above, organizations may not even be aware that sensitive data has been stolen from them (and for many months, no less). Moreover, other firms in the same industry may not be aware of attacks of their competitors or even partners. Finally, and, again and again, I am seeing real commonalities between supply chains, behavior, and cyber crime activities: how confident are you that the software that is to battle computer viruses, malware, denial of service attacks, etc., delivers what is being promised? Here we get into the quality of outsourced production! As noted by Ablon, Libicki, and Golay in their 2014 Rand Report, the black market for cybercrime products can be more profitable than the illegal drug trade. They also argued in their study that an economic approach to tackling cybercrime in warranted, which I completely agree with. I had been researching the network economics of cybercrime for two years and had spoken both at the INFORMS Minneapolis conference last year and at the Boston Analytics Conference on the topic and, after our workshop, completed a paper: "A Multiproduct Network Economic Model of Cybercrime in Financial Services." In this paper, we propose a network economic model of cybercrime with a focus on financial services, since such organizations are one of the principal targets of such illicit activity. The model is a multiproduct one and constructed as a layered bipartite network with supply price, transaction cost, and demand price functions linking the networks. A novelty of the new model is the incorporation of average time associated with illicit product delivery at the demand markets with the demand price functions being decreasing functions of such times, as noted in reality. For example, it is recognized that there is a short time window during which the value of a financial product acquired through cybercrime is positive but it decreases during the time window. Following the major Target breach, credit cards obtained thus initially sold for $120 each on the black market, but, within weeks, as banks started to cancel the cards, the price dropped to $8 and, seven months after Target learned about the breach, the cards had essentially no value. In addition, different “brands” of credit cards can be viewed as different products since they command different prices on the black market. For example, credit cards with the highest credit limits, such as an American Express Platinum card, command the highest prices. A card number with a low limit might sell for $1 or $2, while a high limit can sell for $15 or considerably more, as noted above. In the paper, the governing equilibrium conditions are formulated as a variational inequality problem with qualitative properties of the solution presented. An algorithm, with nice features for computations, is then applied to two sets of numerical examples in order to illustrate the model and computational procedure as well as the types of interventions that can be investigated from a policy perspective to make it more difficult for cybercriminals to obtain sensitive data. Yesterday, we held our Workshop on Cybersecurity Risk Analysis for Enterprise Security, at MIT's Sloan School. The event was sponsored through a grant that we received from the Advanced Cyber Security Center (ACSC): Professors Wayne Burleson of the College of Engineering, Mila Sherman of the Finance Department, and Senay Solak, and I of the Department of Operations and Information Management at UMass Amherst. The workshop was fabulous with panelists and participants from the ACSC, academia, industry, and government. The Isenberg School posted a nice news release on our workshop. Below, I capture some of the highlights through photos of the speakers, panelists, and venue. I followed with my talk on Network Science and Economics, which can be downloaded, in its entirety, here. And, as "icing on the cake," I got to meet a Wharton PhD, whose dissertation advisor was Dr. Pat Harker, then the Dean of Wharton. Pat is now the President of the University of Delaware. Her dissertation was on stochastic variational inequalities, so it was extra special to be able to talk with her! Many excellent research questions were generated and I hope that the great momentum established continues given the importance of the issues raised and discussed! In order to address the cybersecurity challenges we need private - public partnerships with academia, industry, and government, such as the one that ACSC is building. Thanks to everyone for such a rewarding day professionally and intellectually! The number of disasters is growing as well as the number of people affected by them from the Ebola epidemic in western Africa to the floods in Kashmir to humanitarian crises in war-torn Syria, Iraq, and eastern Ukraine. The challenges faced by citizens, humanitarian organizations, governments, and even businesses in dealing with disasters are immense and the research questions have never been more timely. Together, with Professors Panos M. Pardalos and Ilias Kotsireas, we are organizing a conference that will take place in Greece this summer that should not be missed. Francesco Zirilli (Universita di Roma La Sapienza, Italy). I hope that you can join us - we need the best minds to tackle the problems that we are facing. When the invitation came to speak in Berlin, Germany, I was very intrigued especially when I heard that the conference would be interdisciplinary. 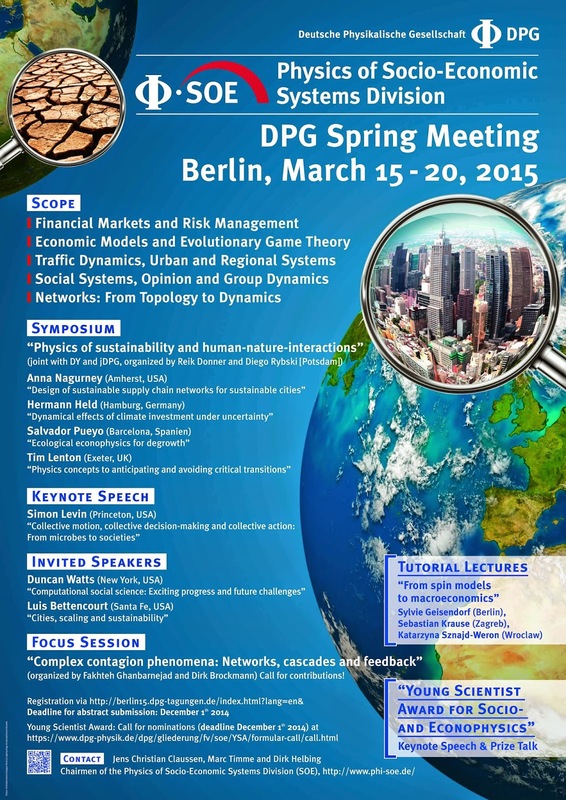 I was specifically invited to speak at the Symposium on Physics of Sustainability and Human-Nature-Interactions, which is part of the DPG (the Deutsche Physikalische Geseltschaft) Spring meeting, which will take place March 15-20, 2015 and what a program! I just received the lovely poster announcing this event, which I have posted below. I expect that the attendance will be fabulous. Many thanks to the organizer: Professors Jens Christian Claussen, Marc Timme, and Dirk Helbing! Coincidentally, the last time that I saw Dirk was precisely at this time in Zurich, Switzerland at the fabulous ETH Risk Workshop that I blogged about. In the meantime, I will be practicing my German. Today is a picture perfect September day in beautiful Amherst, Massachusetts. We just returned from the 10th Annual UMass Amherst Faculty Convocation at which our new Provost, Dr. Katherine Newman, gave her first speech and we honored 8 outstanding faculty members: with the Award for Outstanding Accomplishments in Research and Creative Activity. It was a wonderful ceremony with music, singing, a great speech by our new provost and remarks by our VCRE Dr. Michael Malone. I took the photos below at the event and the delicious lunch that followed at the Campus Center. I was joined by my doctoral students in Management Science at the Isenberg School. Back in 2005, I was honored with the same award in the first group of recipients. The past decade has flown by! One reason that I have not posted in a few days is that, yes, I have been very busy writing letters. The life of a professor has a rhythm, which I very much enjoy, with the semester schedule, the teaching, and with research and service throughout. Professors are also writers and, not just in terms of publishing, but, also, in terms of letter writing, which you may have thought was a dying art. Not so, at least not when it comes to professors! In the Fall, we are very busy writing letters of recommendation for our graduate students, especially doctoral students, as they seek jobs at colleges or universities. A carefully crafted recommendation letter highlighting the student's special strengths and skills can differentiate the application from the others. This is a time-consuming task but also pleasant in that the student has reached this mileston. In the Fall and Winter, we are also busy, in addition to our other professional duties, with writing letters of recommendation for our undergraduate students who are hoping to secure an exciting job in their majors. Luckily, many of these letters can be uploaded and submitted electronically, which certainly saves on postage and time! Sometimes, one even receives requests to serve as a reference for a colleague at one's institution or another one, who may be seeking other challenges and is applying for jobs. One has to make time for such letters, as well. In the summer (and one gets busier with these the longer one has been in academia), there are many requests to be an outside reviewer of promotion & tenure packets. After 6 requests last summer, several of which were international, I had to decline doing more because I did not have enough time to review the portfolios and September with the new academic year was approaching. Also, throughout the year, and deadline depending, there are requests for nomination letters of various sorts - for students awards, faculty awards and fellowships, and even staff awards. This is another important service activity that faculty engage in and, I must say, it is very gratifying, when the applicant or nominee gets the award/job/recognition that you wrote a letter for! Of course, where would our scholarly communities be without the submission and reviewing of journal articles?! These usually require a cover letter, so more writing practice here, as well. Finally, I feel it is very important (I am rather formal, I do admit) to follow-up speakers' talks with a nice thank you letter. These I may copy to higher level administrators, as well. Those who put out the extra effort should be recognized and acknowledged and a thank you letter is the least that one can do! I have a collection of thank you letters hanging in my home office, which I very much appreciate the writers taking the time to do! Congrats to Our Isenberg School PhD Students in Management Science! Today was the first day of the new 2014-2015 academic year at UMass Amherst and it was great to see so many students back on campus! The energy that the students bring to campus is fabulous! After teaching my undergraduate Logistics & Transportation class, where we experienced, for the first time, a power failure as to the computer technology - no problem - I used the blackboard to introduce the course and syllabus, the good news arrived! I always say that good news comes in "threes"! Today, we heard that 3 of our doctoral students in Management Science, all of whom were nominated to attend the 2014 INFORMS doctoral colloquium, which will take place, beginning with a dinner on Friday, November 6, and ending with an all-day affair on Saturday, November 7, 2014, were selected for participation! The doctoral colloquium takes place immediately before our Annual. INFORMS meeting in San Francisco in November. Congratulations to Dong "Michelle" Li, who is my doctoral student, working on supply chain competition in quality, to Heng Chen, who is working with Professor Senay Solak, and to Tulay Varol, who is working with our PhD Area Coordinator, Professor Ahmed Ghoniem. Our Management Science PhD students rock! Thanks to INFORMS for creating this valuable professional opportunity for our PhD students. The Isenberg School of Management has a long tradition of its students in Management Science being selected for the INFORMS doctoral colloquium and all who have participated have greatly benefited from and enjoyed the experience. Thank you, INFORMS, for being such an outstanding professional society!